This review is broken into non-spoiler and spoiler portions. Jordan Peele’s second film after the critical and box-office success of ‘Get Out’ is a fiendish screamer with a fair amount of imperfection. It is a total blast and seeing it with a lively audience is highly recommended, but for all its dark meaning and grand ambition, loose threads and half-baked world building hold it back from being a true masterpiece. ‘Us’ introduces the Wilson family as they are on their way to a vacation home in upscale Santa Cruz, California. Adelaide Wilson, a former ballet dancer and her charmingly geeky husband Gabe (Winston Duke) drive with their children Zora (Shahadi Wright Joseph), an appropriately over-it tween and Jason (Evan Alex), a mask-wearing oddball with a love of pranks. Wanting to spend time with their friends the Tylers, they are barely at their gorgeous beach house when Adelaide expresses discomfort at being in Santa Cruz. As a child, Adelaide was visiting the beach boardwalk and became separated from her parents. She was only missing for fifteen minutes but when her parents found her, she refused to speak and underwent therapy. We don’t know what happened to Adelaide, but she does not want to be here. The affable but emotionally second-guessing Gabe eventually guilts her into meeting their friends at the beach. At the beach we are introduced to the wealthy and comically insufferable Tylers. Kitty (Elisabeth Moss) is half-drunk and hilarious, her husband Josh (Tim Heidecker) is cocksure and drenched in one-upmanship which he happily flaunts to Gabe’s quiet dismay. The Tyler children are twin nightmare millennials Becca and Lindsay (Cali Sheldon and Noelle Sheldon) who casually vocal fry racially insensitive criticisms at the Wilson children. In this spare scene at the beach we know all we need about these families’ dynamic. Gabe’s new boat, the beach house, this whole trip is in a vain attempt at keeping up with the Tylers. Something the Tylers observe with pretentious bemusement. When Jason briefly wanders off, Adelaide becomes frantic recalling her own experience being lost in this same spot as a child. Jason is found unharmed but she is so shook from the experience that they go back to the vacation home. Adelaide desperately wants to go home and explains an inescapable feeling of dread which falls on Gabe’s deaf ears. He doesn’t want to cut their vacation short. He is never malevolent but oafishly obstinate. Shortly after, her fears seem to be confirmed as the silhouette of a family can be seen in the driveway. Adelaide immediately knows something is wrong and calls the police to her husband’s annoyed disbelief and he goes out to confront the visitors. It doesn’t take long to realize the invited guests have bad intentions. The family invading the lives of the Wilsons are animal twins. Ruthless shadows. Not evil as much as grotesque reflections. The little boy Pluto is a darkly playful animal, face hidden by a mask and crawling on all fours. The girl Umbrae is focused as Zora is detached, affixed with a sickening grin. Abraham is a grunting buffoon, built like a ton of bricks and physically crushing in all the ways Gabe is weak. At the center and giving nearly imperceptible orders to the family is Red, Adelaide’s twin. She is the only one who speaks and when she does is it in a scorched gasp. She reveals they are called ‘The Untethered.’ They are here for revenge and they want to take their time. What follows is a series of tightly paced and flawless horror set pieces that are as much fun as they are terrifying. 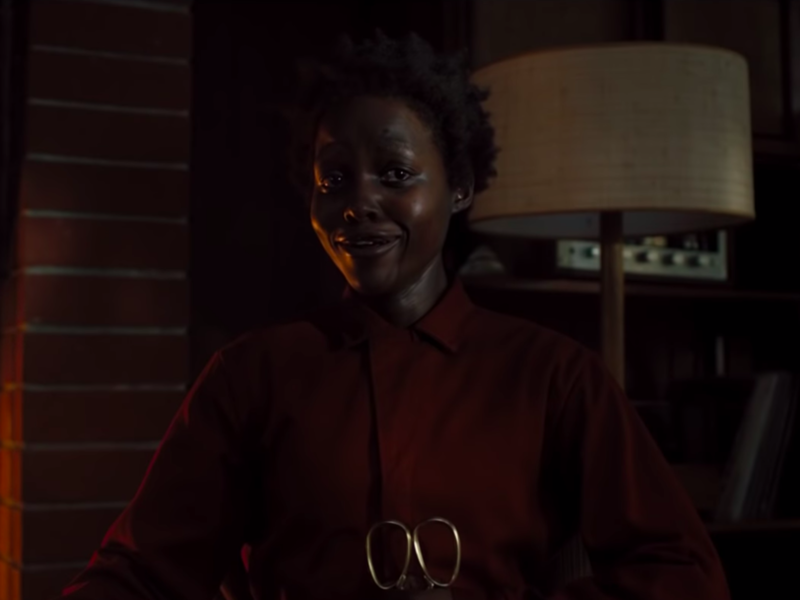 Jordan Peele realizes the joy in being scared and revels in toying with his audience. This film was an absolute blast to watch. The vocal reactions from the audience were wonderful and reminded me of ‘Get Out’s’ similar response. You should see this on the big screen. Experiencing this with a live and responsive audience is rare and essential treat. Peele’s direction here is flawless and he once again displays that he is a naturally talented filmmaker, of equal importance and worth the price of admission alone are the performances. Actors performing dual-roles have rarely produced results this rewarding. Contorting their faces into toxic imitations of humanity, mocking us with false emotion, bubbling over with envious hatred, the Tethered are iconic and the actors must have had a blast playing them. There is not a single weak link. Winston Duke’s Abraham is imposing and sad. The children Umbrea and Pluto are swift and lethal. There are cartwheeling murderers and dead-eyed seekers. But the Coup de grace is Lupita Nyong’o’s Red. Truly unlike any performance I’ve ever seen, she moves with razor calculation, twists her face into a leering death mask and exudes a menace which reaches out from the screen with a begloved hand and doesn’t let go. Nyong’o’s perfomance is something will likely be puzzled over for years to come. ‘Us’ is a terrific film and absolutely deserves to be seen. But it does have failings. Most of the ways it fails is due to the inescapable comparisons to ‘Get Out.’ After dozens of viewings, I truly feel that ‘Get Out’ is a perfect film. I almost always catch something new when watching it. The lore and character motivations are flawless in their execution. We are given the keys to piece together unanswered questions. ‘Us’ is not perfect. It is a magnificent genre exercise, a horror at once familiar and strikingly original. It is packed with clever homages and directed with precision. The acting is unnerving and superb by a cast who are each called to play dual roles. It does however feel like it’s reach exceeds its grasp. 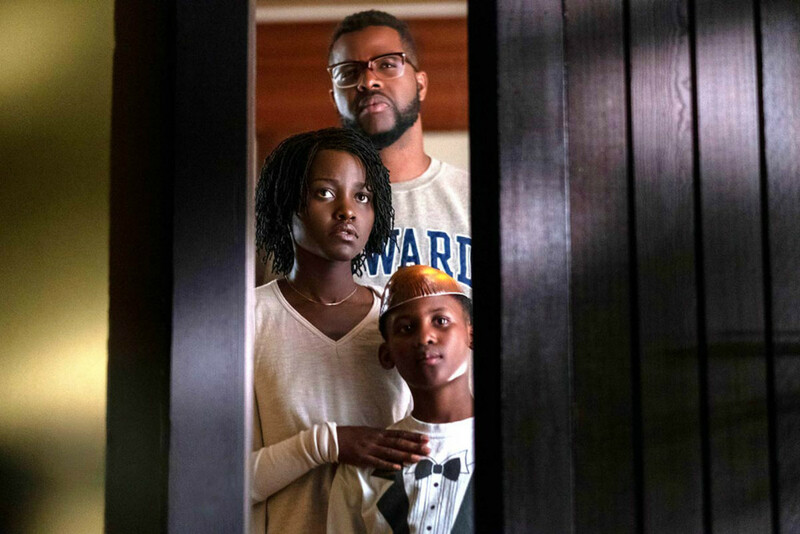 Jordan Peele has set forth to tell a story that is much larger and more poignant in its parable. ‘Get Out’ had a lot to say, not only the shameful history of slavery and centuries of racial subjugation, but of the fetishization of blackness and the bourgeois white lie that buries culpability beneath progressive politics. ‘Get Out’ does not accuse everyone. But it serves as a wake up call for racial complacence. ‘Us’ on the other hand accuses everyone. All of us. That title is not accidental, nor is the connection most have likely made already to the double meaning: ‘U.S.’ At one point Lupita Nyong’o’s monstrous shadow twin answers a question of who they are with a simple line “We are Americans.” On hearing that line I momentarily winced at the ham-fistedness until I remembered that these are the tools Peele is working with. If he is an artist concerned with moralistic subtlety, he wouldn’t so frequently swing metaphoric sledgehammers. Peele doesn’t seem interested in obfuscating themes, he wants to make them starkly clear. He wants you to spend your time thinking about what those things mean. On a grand level, this film succeeds spectacularly. Its failings come in the small details. In his commentary for ‘Get Out,’ Jordan Peele says he is happy to “nerd out” and provide as many details as possible. He is a filmmaker who luxuriates in having his films ruthlessly explored and creates deep lore only hinted at in the text. As I write this, the film has still not been released. I desperately want to watch ‘Us’ again and see if my concerns are erased, but I don’t think they will be. After seeing ‘Get Out’ so many times, I felt prepared to look for clues. I don’t feel confused. I just think he left loose threads and at times was more concerned with creating a vision than making sense. I might forgive this with other directors but it is Peele’s own established perfectionism and attention to detail that betrays him. He didn’t quite stick the landing. I will attempt to articulate these concerns in a spoiler portion below the photo. One of the things that made ‘Get Out’ such an enduring film was the imagery it employed. The Sunken Place. The teacup. Walter running straight at you through the darkness before making a sharp turn (something that inspired a viral video challenge.) Chris’s face with tears streaming down it or sitting horrified strapped to an easy chair. ‘Get Out’ was filled with so many instantly iconic scenes that even if it had failed in the box office, it was destined for cult success. Jordan Peele seems well aware of this and often speaks of his love for films like Kubrick’s ‘The Shining’ or Spielberg’s ‘Jaws,’ films enthroned in cinematic history. I don’t doubt that when he set upon making ‘Get Out,’ he had an eye for creating immediately memorable images. In ‘Get Out’ they were organic and completely appropriate for the story. With ‘Us’ I can’t escape the feeling that Peele started with an image he wanted to put on film and wrote a way to get to that. It’s a small but important distinction. One of the places this seems most evident is in the imagery of Untethered standing in a line holding hands. ‘Us’ opens in 1986 with a commercial for Hands Across America as a way of establishing time as well as foreshadowing this future image. Hands Across America (something I’m foreseeing will have a substantial jump in search engines over the next few week, someone will probably write an article about it) was a charity event meant to raise money for homelessness and poverty. It was, to be sure, an ultimately good thing raising $34 million (less than half of which ended up going to the poor after “expenses.”) But it was also the kind of low-effort fleeting gesture that affluent people in the decade of excess could do to make themselves feel better about their lifestyles. The 80s were full of them. Peele’s version of this is seen in the Tethered Wilsons appearing in the driveway, in various Tethered seen across distant roadways, in a paper people chain that Red cuts in the film’s final act, and eventually in the final scene which shows thousands of Tethered forming a hands-interlocked chain across the country. I’ll admit it’s a compelling image. But it doesn’t make any sense. If the Tethered were non-violent and were trying to show themselves for acceptance this might make some kind of impact. But the Tethered immediately come to the surface and start murdering people indiscriminately. Are we to believe then that the mission of a Tethered upon reaching the surface is to murder anyone in the immediate area, then form a chain? Maybe the chain is a wall of some kind. An impassable wall. And they will murder anyone who gets near. Okay. I don’t buy it. They are armed with scissors. If people started coming out from the sewers and started to kill American citizens in the streets, how long before law enforcement and the National Guard are everywhere and shooting them dead? The imagery of the scissors is great for the idea of the Tethered and their mission of what they call ‘The Untethering.’ Those giant gold scissors look great with the fingerless gloves against the red jumpsuits but where did they get all the scissors? The Untethered are in what’s supposed to be some kind of forgotten underground complex and there are literally thousands, maybe millions of gold scissors? Same with the red jumpsuits and gloves. They just had them down there? The Tethered are shown wearing regular clothes in flashback scenes. Maybe the jumpsuits were the uniform of the people who worked there. If so, it seems unusual to have as many guards/employees as human lab rats. What did the Tethered eat? Oh I know. Rabbits. We even have a brief disgusting scene of the Tethered eating rabbits alive. And I also know that rabbits breed like crazy. But what did the rabbits eat? Were the Tethered somehow engaged in the underground botanics? That doesn’t seem possible as they were just imitating what their twins were doing? Where did they get their water? What about sewage? The image of people above ground at an amusement park and their Tethered below imitating their movements is certainly engaging. But didn’t most of those people drive to the Boardwalk? Like the Wilsons many probably drove a long way. So what happens of their Tethered are in a very different area of the underground? Are there underground cars? That doesn’t seem likely. How do all of the Tethered get to the area below the Boardwalk if their twins drove or flew there? There shouldn’t be twins below. The whole idea is highly flawed. The final twist in the film has us discovering that the little girl who got lost in 1986 was taken underground and the character we know as Adelaide is actually the Tethered version and has been for decades. When Red is telling the story to the Wilsons, her words don’t seem to support this final twist. Neither does the way they talk to each other in their final confrontation. This is an interesting idea but it doesn’t feel properly earned. Despite those concerns I still absolutely loved ‘Us’ but the premise has a lot of holes. If Jordan Peele was a filmmaker dealing in strictly abstract ideas, I would not take him to task for these things, but he seems like the type of movie fan who would have the same gripes of films he loves. I’m surprised that he did not provide better explanations. Especially with as air-tight the lore was in ‘Get Out.’ He is tackling very big ideas here but he seems to have valued creating iconic imagery above narrative cohesion. It’s likely that Peele will answer many of these questions as he did in the director’s commentary for ‘Get Out,’ but as of now ‘Us’ creates more questions than answers.